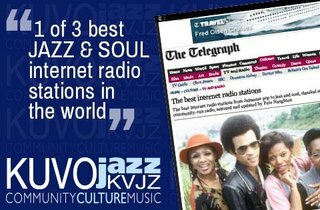 Denver's own KUVO 89.3FM public radio station was named one of the best Internet jazz radio stations worldwide, by Pete Naughton a writer for The Telegraph, one of the United Kingdom's' top media outlets. Naughton, who writes for their podcasts and internet radio columns, listed KUVO as one of the top three best "Jazz & Soul Internet Radio Stations" he's discovered across the world. Below, what he reported in his column, "Best Internet Radio Stations" online on May 26, 2014. I stumbled upon this award-winning music station by accident recently - and have been kicking myself for not finding it sooner. Based in Denver, Colorado, its artfully-curated playlists mostly focus on jazz - broadcasting everything from Ella Fitzgerald through to Madeleine Peyroux. A class act. "We knew KUVO was a gem when we merged our public media organizations last year," said Doug Price, President & CEO of Rocky Mountain PBS. "We're proud of the work they do and the valuable service they provide to our Colorado community. We are excited for the future and the international doors that have been opened with the online radio stations and mobile app." KUVO serves a culturally rich, diverse audience that loves jazz - all styles of jazz. Our station's line-up on air and in the studio reflects the flavors of jazz from around the world. You want Latin jazz, Afro-Cuban jazz, jazz funk, jazz fusion, soul jazz, any jazz - we've got it. We celebrate jazz talent from old to new and local to legendary. It's what makes our station unique. "We are proud of this international recognition," said Carlos Lando, KUVO's General Manager. "We've always been proud of our long tradition of sharing jazz, blues, and news with our loyal listeners in our community. But, it's really fantastic that our community is growing worldwide. We have fans from Japan, Spain, France, and apparently the UK." Rocky Mountain PBS celebrates its 58th anniversary on the air this year. The network began in Denver in 1956 as Colorado's first public television station. It is now Colorado's only statewide television network, with stations in Denver (KRMA), Pueblo/Colorado Springs (KTSC), Steamboat Springs (KRMZ), Grand Junction (KRMJ) and Durango (KRMU). To learn more, visit rmpbs.org.